Make no mistake about it, when you become a player at any of our rated and approved Microgaming powered casino sites, if you are a slot player then you are instantly going to be overwhelmed by just how many slot games will be on offer to you at those sites when you log into your casino account! However, with that in mind please do take a look through not only the following slot game review but some of our many other ones, as by doing so you will be able to make a decision on just which slots you will enjoy playing before you log into your casino account! The Lumber Cats slot game is something of a comically themed slot game on which you will find a cast of Cats who are all Lumber Jacks! Not only that but it offers a couple of Lumber Jack themed bonus games on which when they are playing off you could win big in an instant! Playing off any one single base game spin will see you having the chance to win a 6000 coin base game jackpot for each coin per line you wager. A race will be played out in front of you when you trigger the Tree Climb bonus game on the Lumber Cats slot game, and to be awarded with that feature you need to have had at least three of the Tree scatter symbols spinning into view on a base game spin. Once you do so you have to pick one of the three Cats displayed on the bonus game screen and the three Cats will then climb up a tree and depending on where the one you selected finishes in that tree climbing race a cash payout is awarded to you! If you spin in on the first and last reel a Log symbol and also on the middle reel that being reel number three the Lumber Cat symbol then you are awarded with a set of 5 free spins. Those free spins will start to play off immediately, however the middle reel will be covered with Lumber Cat symbols for the duration of the bonus game, and those symbols for reference are wild symbols! An optional gamble game can also be taken as soon as one or more winning payouts have been formed on the base game. 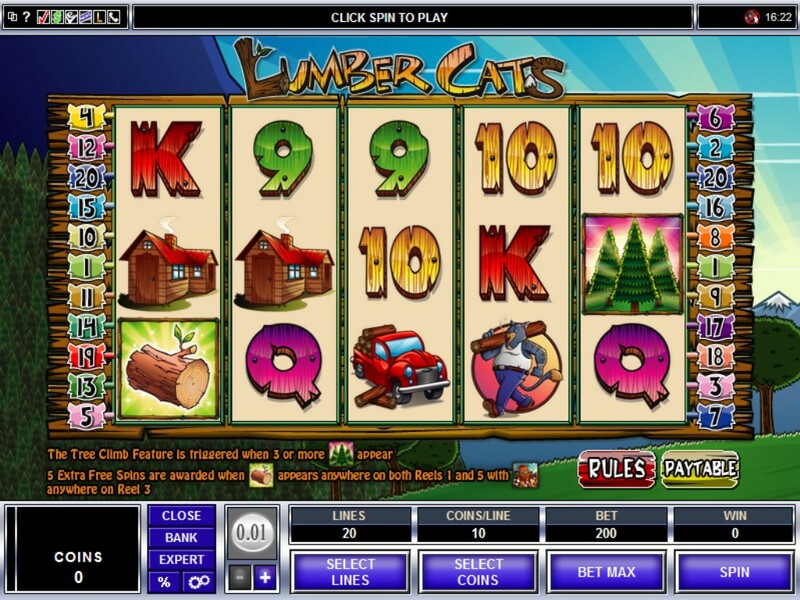 The Lumber Cats slot is going to be giving you a highly volatile playing format and that is one thing that you should always keep in mind when playing it. If you make the commonly made mistake of playing it with the stake value set way to high for your bankroll, then do not expect that bankroll to last too long. However, having said that if you are prepared to take a few risks every now and then when playing Microgaming online video slots then the Lumber Cats slot may be one worth playing, for slightly higher stakes! You will always find it is above all else a fair and random slot and with its certified and fully verified long term RTP of 96.41% then plenty of your stakes will be paid back out to you over the long term. The one part of this slot that is very exciting and can be a potentially high paying one it is the Log Roll Feature and as such when playing this slot over any length of time that is the feature game you will be hoping to trigger thanks to that expanding wild symbol!